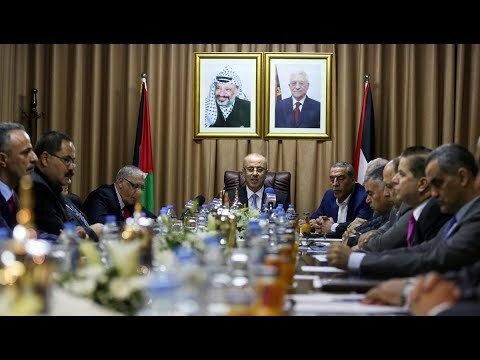 Hamas and Fatah​ Meet in Gaza: Will They​ Strike a​ Unity​ Deal? Palestinians living under Israeli occupation are divided in two areas: the West Bank, which is governed by the Palestinian Authority led by the Fatah party and the Gaza Strip, which is governed by the Hamas party. In the elections that took place back in January of 2006, Hamas won 74 of the 132 seats, winning the elections but the international community disregarded the wishes of Palestinian people and would not accept the results and the Hamas party. So, Hamas receded and took over the Gaza Strip by force in 2007. Since then, the Hamas and Fatah parties are in a state of open conflict. This week, a joint cabinet meeting of Hamas and Fatah in Gaza was held in an attempt to reconcile the differences. Palestinian Prime Minister Rami al-Hamdallah opened the joint meeting with a hopeful note. TRANSLATOR:	Today, we are back again in Gaza to overcome all the obstacles and open the door for hope, will, and unity and to give the government of national consensus the chance to assume all its responsibilities in the southern governance in all sectors, side by side, and with all of the Palestinian parties. SHARMINI PERIES:	Here to analyze the significance of this meeting is Daoud Kuttab. Daoud Kuttab is an award-winning Palestinian journalist and former Ferris Professor of Journalism at Princeton University. He is a columnist with Al-Monitor. Thank you so much for joining us today. DAOUD KUTTAB:	Thank you for having me. SHARMINI PERIES:	Daoud, let’s begin with the Hamas party who canceled their administration in the Gaza strip as a gesture of reconciliation, and are openly calling now for a reconciliation and for an end to the rift between the two parties. Is Fatah reluctant? And why has the president, Abbas not already accepted this move of reconciliation? DAOUD KUTTAB:	He has accepted it publicly. He hasn’t come to Gaza yet, but Mahmoud Abbas basically put down three conditions and Hamas accepted the three conditions for a number of regional reasons or regions having to do with Hamas itself. But the fact is that they accepted unconditionally the request by Mahmoud Abbas, and now the government of Mahmoud Abbas is in Gaza to take over the cabinet, the different posts and to unify the government because until now, we had two governments, two laws, two systems. And now, we are hopefully coming back to a single, unified government that runs both Gaza and the West Bank. I think the key issue still is the border crossings. If the Hamas, as they’ve said, are willing to allow the Presidential Guards to take over, especially the Rafah Crossing with Egypt, then I think that would open up the chance for Mahmoud Abbas to come into Gaza and visit. SHARMINI PERIES:	What are the three conditions that he laid down as a precondition to these reconciliation talks? DAOUD KUTTAB:	Yes. They were asked to dissolve what is called the Administrative Committee, which is a kind of a shadow cabinet. They were to turn over all the government positions to the single authority from Gaza and from the West Bank and to allow the cabinet to meet and to carry out its duties as a single government. These are the conditions that Hamas accepted unconditionally. SHARMINI PERIES:	So these are peculiar conditions where Hamas is accepting the conditions laid before them without much resistance. Why is this taking place? DAOUD KUTTAB:	A number of regional changes have happened that weakened Hamas. Hamas had this stronghold in Syria and Iran, and Hamas took a different position from Bashar al-Assad and the Iranian government, so that lost them Syria and Iran. They also lost their allies in Egypt when the Muslim Brotherhood were kicked out by the army. And recently, the Qatari saw the conflict as it meant that Qatari could not continue to fund them. So, they found themselves orphaned, if you will, without much sources of funding so they needed to get back to their fellow Palestinian brothers. SHARMINI PERIES:	Right. Recently, the US President Trump hinted that he is about to present a new peace initiative. If the Palestinian parties and a unity government is formed and announced, will this undermine the Palestinian position as far as these negotiations are concerned? DAOUD KUTTAB:	That’s clear. It will strengthen the Palestinian position and by strengthening the Palestinian position, if you will, it might make it more difficult to accept surrender to the American-Israeli Zionist plan. But I think the Palestinians can now speak with one voice in a stronger way. Now, if that will weaken the possibility of a dictate by Washington, then so be it, but I don’t think it will weaken the Palestinian position. But it might increase the chances that the Palestinians would reject a bad deal that would be offered by the likes of Kushner, Greenblatt and David Friedman, who have all shown a much more bias toward the Israelis than being a neutral peacemaker. SHARMINI PERIES:	Right. Then, the obvious question is, if there is a unity government formed and there seems to be a greater unity and harmony and reconciliation between Fatah and Hamas, will this obviously make things uneasy for the Israel government? In these kinds of situations, they always try to disrupt any harmony by attacking Gaza or creating some disruption to the process. Would you expect that? DAOUD KUTTAB:	Well, you know, the Americans and the so-called Quartet which is the EU, Russia, the UN and the US, issued a statement almost simultaneously with the beginning of this process supporting the reconciliation. So. I think Netanyahu and his government took a few days off and they didn’t attack what was happening. Today, unfortunately, this quietness ended because Netanyahu made a very strong statement saying that a unified Palestinian government must recognize Israel and must recognize Israel as a Jewish state, which is something Abbas has never accepted or most Palestinians. So, it’s clear that the Israelis, the two-day honeymoon is over and they’re already starting to create obstacles to the reconciliation process. But I don’t think it will succeed. I think it’s clear that both groups, Hamas and Fatah, and the Palestinian population as a whole are intent on ending this dark chapter and having a reconciliation that takes root in Gaza and the West Bank. SHARMINI PERIES:	Finally, Daoud, what is the role of Mohammed Dahlan in the current political maneuvers between Hamas and Fatah? He was kicked out of Fatah and it was reported that he negotiated with Hamas recently. What interest does he represent in all of this? DAOUD KUTTAB:	Dahlan, as you said, is a renegade Fatah leader. He’s no longer on the roster of Fatah, but he has ambitions of returning. He’s had very strong relations with the United Arab Emirates and with President Sisi of Egypt. His mortal enemies were the Hamas group, but for some reason because he’s dying to come back, has opened up a dialogue with Hamas, something that really angered even more President Abbas. But some believe that also speeded up the reconciliation process because of fear that a new alliance would be created between Dahlan, Egypt, the United Arab Emirates and Hamas. So that, in a way, worked in the favor of the reconciliation. SHARMINI PERIES:	All right. Daoud, just one more. In April of 2014 when Fatah and Hamas declared a temporary unity government in order to hold democratic elections, that process was stopped with the brutal Israeli invasion, first of the West Bank and then Gaza. This raises the question whether another such invasion is likely to affect this reconciliation. Your thoughts on that? DAOUD KUTTAB:	It’s not clear. I think the process now seems to be much deeper and much more serious. I think the role of the Americans and the UN, and even the Russians is much more serious this time and I don’t think the Israelis will anger the Americans too much at this time. So I think unless something major happens, I think it will proceed positively. We’re also supposed to have within three to six months new elections for parliament and for presidency, so it’s a very important process to continue and to give legitimacy to the newly elected, hopefully, government and to give people some relief. One of the reasons why everybody, certainly the Americans and to some degree even the Israelis, want this process to succeed is because Gaza is about to explode. Unless this happened, there was real danger that there will be another explosion in Gaza and everybody will suffer as a result. So, I think deep down, the Israelis also understand that Gazans need relief, both economically, electricity needs to be back up, people need to find jobs and people need to get the emotional relief of some kind of a positive future. Otherwise, there would be real violence, and nobody will be happy with that. SHARMINI PERIES:	Daoud, what is the status of the one-state or two-state solution to the conflict in Israel? Where are things at? DAOUD KUTTAB:	Well, the US under Trump has yet to accept publicly or to even utter the words “two-state solution,” so we don’t know where the Americans stand on this issue. In his last speech at the UN General Assembly, President Abbas concluded his speech by saying that we want freedom and if the two-state solution will not work out, we will ask for equal rights in one state, a statement that really caught people off guard and encouraged those who, especially young Palestinians who have lost their faith in a two-state solution. So it’s hard to say. Obviously, the Israelis are neither supportive of one state or two states, but I think the options are clear. Either you’re going to have apartheid and total long-term discrimination or the Israelis have to understand they have to either share the land or share the power and there are no other choices for them. So, if they don’t want a two-state solution, they will find themselves one day not being the majority in the land between the River Jordan and the Mediterranean, something that will play into the hands of the one state supporters. So, it’s really interesting how the dynamic is happening. A lot of encouragement was taken when Abbas legitimized the concept of a one-state solution, but I think if there is no progress on two-state solution, you will see many more legitimate, serious voices calling for a one-state solution. SHARMINI PERIES:	Daoud Kuttab, I thank you so much for joining us and we’ve learned a lot in this interview, so I thank you for that.